If we were to judge by the caves existing in the area of Brotnjo as well as in the parish of Medjugorje, we can't completely exclude the possibility of habitation as far back as the older Stone Age period. From the later Stone Age period, there is material proof of the existence of a pre-Illyrian culture and civilisation in the area. In the older Bronze Age, there is evidence of Illyrian tribes. Copper objects found in the area are proof of an intensive lifestyle. Some walled settlements on the higher points, so-called "gradine" (castle ruins), which were either circular or square in shape, date from this period. A double wall surrounded some of them. 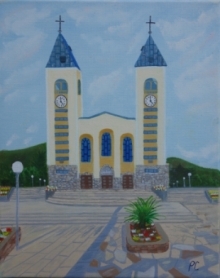 In the parish of Medjugorje, there are still existing examples of the double-walled "gradine": in Surmanci and above Medjugorje itself in Zuzelj. Apart from the "gradine", the most eloquent evidence of the Illyrian civilisation (which is abundant in Brotnjo and indeed in the area of Medjugorje itself) are the graves of the Illyrian dignitaries. In the second century before Christ, the Daors allied themselves with the Romans and waged war with the Illyrian tribes of Dalmatia. Brotnjo first belonged to the Illyrian province of Dalmatia, which has its administrational seat in Solin near Split, and from the third century to the setting of Narona. The writings on the gravestones testify that Roman legions and cohorts were situated in the area, and that Roman veteran soldiers lived there. There remain some parts of a road from the time of the Romans, constructed in the 3rd century. Apart from that, many Roman memorial tombstones and objects of everyday use have been found. The most significant archaeological site from the Roman time is to be found in the Catholic cemetery in Miletina, where some vestiges of buildings made of Roman bricks have been discovered, but it hasn't been sufficiently examined. At the end of the 6th century, Croatians began to establish themselves in these regions. The region of Brotnjo represented a tribal political-territorial unit, a district, with a tribal regional chief, a district prefect. Brotnjo always belonged to the land of Hum, which in 1322 fell under Bosnian administration. From 1357, this area then belonged to the Hungarian Croatian King, Ljudevit I. From the mediaeval period, the most famous memorials of the civilisation in this region are the "stecak" - truly indigenous autochthones grave memorials. In many ways the "stecak" from Herzegovina are superior to those from the rest of Bosnia, Herzegovina and Croatia; in the number and in the dimension of burial grounds, in the beauty of their ornamentation, and in their worth regarding artful elaboration. In Brotnjo itself there are many burial grounds and "stecak", likewise in the area of Medjugorje. Man-formed crosses with arms raised in prayer are sculpted into some of them. Up to the 12th century, this area was Glagolitic. The famous “Plaque of Humac” testifies to this. In the second half of the 12th century a form of the Cyrillic alphabet called “Bosancica” prevailed. In the area of Brotnjo, not one mediaeval Latin inscription is to be found, only Croatian inscriptions written in “Bosancica”. Christianity arrived to the area surrounding Medjugorje in the time of the Romans. Judging by the amount of early Christian church ruins it was extensively widespread. In large part they were destroyed, and churches were levelled to the ground during the time of the migration in the 6th and 7th centuries after Christ. The Croatian settlers accepted Christianity very early: They started to be baptised as early as the 7th century. However, the Catholic Church never became really solidly established in the mediaeval Croatian Bosnian state, which facilitated the expansion of the "Bosnian Church." In the 13th century, the Croatian Bosnian state, which included the land of Hum (Herzegovina), was firstly visited by the Dominican missionaries and, after their lack of results, the Franciscan missionaries who accomplished great success in bringing the Bogumils or “Bosnian Christians” back to the Catholic Church and the Catholic faith. Bosnia and Herzegovina fell under Turkish power in the year 1463. The Turkish invaders wished to occupy the whole of Croatia too, to reach Vienna and Rome, and likewise further west. On their way, the Croatians stopped them; for this reason, the Pope proclaimed them to be the "bulwark of Christianity". Croatia had nevertheless to pay a high price. Not only were many Croatian lives lost in continuous warfare, but the central part of Croatia - its heart - was also snatched away: Bosnia and Herzegovina. The life of the Catholics under Turkish rule was constantly exposed to the forced passage into Islam, to oppression and to persecution. Under the Turkish feudal system, no Croatian could possess anything immovable. Catholics were permanently considered as “enemies of the state,” because their head was in “enemy” territory: Rome. Croatians subsisted from stock bearing and work on the properties of Turkish invaders and of local landlords who embraced Islam; they were paying large taxes in stock, corn, grain and even children. The Turks forcefully snatched their children, made them embrace Islam and used them as Janissaries, special-force units for the purpose of conquering the still unconquered Christian lands, among others their own Croatian country. For this reason, many Croatians were driven to flee westwards. This is how the Moslem element entered into Bosnia and Herzegovina. Up until the time of Turkish occupation of Bosnia and Herzegovina, the area was almost completely inhabited by Croatians. As the Turkish broke in from the east, the Serbs migrated westwards fleeing from them, but later on they helped them in their conquests, and arrived in these areas where heretofore they had never been. The activities of the Franciscans in these areas from the very time of their arrival had a major influence on the survival of Croatians under cultural, religious and every other aspect. The Franciscans emerged in Croatian regions in the first decades of the 13th century. During the whole time of the Turkish occupation (1463 to 1878), the Franciscans were the only ones who tended to the spiritual needs of the Croatian Catholics in Bosnia and Herzegovina, and their only representatives and defenders in front of the Turkish administration. In every way, the Franciscans shared the plight of their people. After the Turks had destroyed all of the Franciscan monasteries in Herzegovina, in the first half of the 16th century, the spiritual care for the Croatian Catholics was taken over by Franciscans from the Christian Dalmatia, i.e. Croatia. During the Turkish administration, the Franciscans were persecuted, tortured and killed, many thrown alive into the river Neretva... After the Turkish rule, only the ruins of the Franciscan monasteries were left. The first Franciscan Province to be set up in the region of Bosnia and Herzegovina was the Bosnian Franciscan Province. In 1852, the Herzegovinian Custody was established, and in 1892 the Herzegovinian Franciscan province was founded, members of which serve today in the parish of Medjugorje. The Franciscans have left indelible tracks in the region of Bosnia and Herzegovina. Many have enriched the Croatian Church with their personal holiness and heroic witnessing of the Gospel; they educated the population, and contributed to the alphabetisation and the development of art and science. In the great wars of the 17th century the majority of parishes in Herzegovina were destroyed, among them the parish of Medjugorje. When relative peace returned to Herzegovina in the 18th century, the Franciscans gathered the remaining believers together and established parishes. The parish of Medjugorje was founded in the year 1892. After liberation from Ottoman rule in 1878, the Austro-Hungarian Monarchy took power in these areas. For political reasons, it didn't want to include the newly liberated areas in the Croatian state to which they historically belonged. And so, once again in history, the Croatian people of Bosnia and Herzegovina remained separated from the motherland. In the year 1914, the First World War began, the reason being the assassination of Franz Ferdinand in Sarajevo, carried out by Gavrilo Princip, a Serbian. In 1918, at the end of the First World War, Yugoslavia was fraudulently brought into existence as the kingdom of Serbians, Croatians and Slovenians. This fraud was brought about by the big powers of the time. In this state, the Croatian people were oppressed, and the parliamentarian who fought for the freedom of Croatians was perfidiously killed in the Parliament, in Belgrade, in 1928. In 1929, the Kingdom of Yugoslavia was established, which was to crumble at the beginning of the Second World War. During the Second World War, the losses of the Croatian people were immense. At the end of the war itself, when the cease-fire had already been officially declared, about 300,000 civilians and soldiers lost their lives at Bleiburg and at what is called the "Way of the Cross" of the Croatian people. According to attained agreements, the Allies were supposed to offer refuge to Croats after their surrender, and to others who were seeking to evade communism. But the Allies, according to the order of the field-martial general Harold Alexander, handed the soldiers and the civilians over to the communists – the partisans. In Bleiburg alone a multitude lost their lives, while the rest of them had to form a 60km long line taking them to the communist Yugoslavia and it's concentration camps. This was the beginning of the Croatian Golgotha, the so-called "Way of the Cross,” which extended from the most northern to the most southern point of the new multi-ethnic state of Yugoslavia. The Partisans killed the Croatians while walking, without trial, without establishing their eventual culpability, at their own discretion. Especially persecuted were the Croatians from Herzegovina. The communists killed 630 priests and nuns from Croatia, Bosnia and Herzegovina. Alone in the Herzegovinian Franciscan province, 70 Franciscans were killed. The Second World War took 344 lives from the parish of Medjugorje. In the parish of Medjugorje, life under communist rule was hard. People were beaten and sentenced to years in prison just because they were Catholics and Croatians. In schools, just as elsewhere in Croatia, the communists tried to separate children from their national identity and their faith. Thanks to the strong faith of the people, they didn't succeed in this. At the same time, the area was systematically economically neglected, with the aim of having as many people as possible leave the area… The pilgrims, who came here at the very beginning of the apparitions, saw all this in action. They found here a very poor region and very rude policemen. The administration didn't permit the slightest help in accommodating the pilgrims; instead, many of them - together with the locals - were persecuted and imprisoned, just because they said that Our Lady was appearing. However, the local people were hospitable and had their standards. The communist tyranny fell in 1990, when the Croatian people unanimously decided for the independence and breakaway from the artificially created Yugoslavia. This, certainly, didn't tie in with the idea of Great Serbian, so the Yugoslavian army, made up primarily of Serbs, militarily attacked Slovenia on the 25th of June 1991 (the tenth anniversary of Our Lady's apparitions), then Croatia and afterwards Bosnia and Herzegovina, desiring to suffocate independence. Several hundred thousands lost their lives during this bloody war. The world could have stopped this bloodshed. It didn't do this because of their respective interests. The E.E.C. kept on condemning the warring sides, hoping to wash its hands and save Yugoslavia as a multinational state, which could be used to further their own aims. James Baker, the Prime Minister of the Bush administration, even permitted the Yugoslav army to attack Slovenia. European and world powers sought out and still seek their own interests in these areas. Because of that, they tried and continue to try to fog-up this war presenting it as a civil war in which all were equal. The truth is, however, completely different and very simple: The Serbs, wanting to create the Great Serbia, attacked other peoples which up until then had lived with them in the same state. They were able to do this because, in ex-Yugoslavia, all the power was in their hands. The major world powers had chosen them as the "policemen" of the Balkans, and because of this, they looked benignly on their actions. Even when they had committed the first genocide, as in Vukovar, the major world powers didn't want to stop them. They only began to stop them when they exceeded every measure, and began to injure the reputation of their protectors. The warfare between Croatians and the Moslem community in Bosnia and Herzegovina (in 1993) began as a series of misunderstandings, but also out of a desire of some foreign intelligence services to occupy as much as possible of the territories in Bosnia and Herzegovina and to consolidate there. The Croatians simply desired that no one other than themselves govern them anymore. They wanted to have their own schools, to be allowed to call their own language Croatian, while remaining in Bosnia and Herzegovina. The Moslem community, the largest in Bosnia and Herzegovina, led by a fundamentalist leadership, wanted to administrate the new state according to the Islamic law and to impose its rule upon the others. For this reason, they brought into the country the Islamic soldiers - mudjahedins - from all over the world, who committed terrible crimes in Bosnia and Herzegovina. This war, however, was stopped very rapidly because it was really not needed. Today, Medjugorje is a part of the state of Bosnia and Herzegovina. Because of the communist administration and the terrible war, the infrastructure of Medjugorje is still underdeveloped. This however, didn't stop pilgrims from coming here, even during the cruelest clashes of the war. Many of them brought aid, thus helping the Croatian people to remain where they were. The Croatian people will never forget this. Today, pilgrims are coming more and more. They want to experience this time of grace with their whole hearts, and not let it pass them by.